Sixty-three boats from nine countries showed up for the 2017 J/24 World Championship at Port Credit Yacht Club in Mississauga, Canada. Quantum’s Travis Odenbach competed with his trusty team on HoneyBadger and walked away with great light-air lessons to pass on to sailors. The dance of light wind sailing - Team HoneyBadger changes modes at the 2017 J/24 Worlds. Photo by Chris Howell. 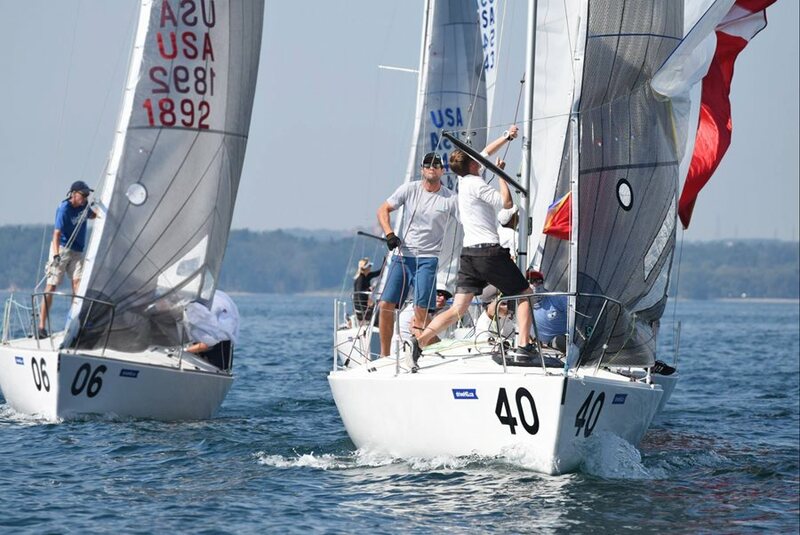 The five-day, light-air battle that defined the 2017 J/24 World Championship was an interesting one to watch unfold. Each day brought the same light wind under five knots which made – among other things – the starting line and first beat difficult. Everyone loves big breeze, but the light air days are where special approaches and considerations can really give you an advantage. This was the perfect event to refresh those skills and after the J/24 Worlds, I have had my fill of light winds and hope that the next event will have some fresh air! I have had time to think about what our team could have done better at the event, and I realized I learned more during the week at the Worlds than I have in the last year of sailing. The most important lesson I was reminded of during the regatta was to always keep the boat moving forward. At the beginning of the event I mistakenly put emphasis on trying to gain height out of the boat right away. Whether it be out of a tack or off the starting line, we wanted high mode to get into the new puff next to us or to get rid of someone on our hip. We quickly learned we couldn’t be too worried about what our upwind or downwind angle looked like in the light air; we simply had to keep forward momentum. If that meant being five degrees lower than the boat next to us, so be it. It’s important to remember always to “sail” your boat. That’s not to say you shouldn’t keep an eye on what others are doing, but take it with a grain of salt and race your race. In these conditions, we had to do whatever it took to keep our boat speed up. As soon as I went for height, my speed would eventually crash and I would have to start the process over again. That’s the biggest reminder I took out of this event: speed first and foremost. In light air, I’d add “momentum” to that adage! Another game changer that got us back into the game was changing our tactics a little for the first beat upwind. Our tactician Geoff Becker is great and likes to stay conservative and not give up leverage to either side. I agree with Geoff on this subject, but what we found was that the line was so long and the wind so light that any shift or puff that came through immediately gave the winning side about a mile gain. At the beginning of the event, we would target the middle, hoping to have a good start, and looking for something good to tack into. A generally solid strategy for our team; however, it just wasn’t working for us on this course with the light air. So we regrouped, identified how we could execute our starts better, and shifted gears. We went to an end with a plan to bail out and get clean air as quickly as possible. A good start is always good, but in super light air it is sometimes better to be alone in better breeze or being slightly lifted. Regardless, it was a great reminder, and, after we changed it up, we came out of the regatta with some of the best scores. Our Quantum customers had an amazing week of results at Port Credit. Longtime customer Evan Petley-Jones’ Lifted was winning after the third day and stayed in the top five, finishing the event in fourth. My hat is off to Petley-Jones’ boat for staying on top in such tricky conditions. Aiden Glackin’s Mental Floss won his first race ever at a Worlds by winning the pin in one of the races. From start to finish, Glackin and team led that race. Evan Petley-Jones was named Top Amateur Team and Finn Hadlock’s Boreas was named Top Junior Team. It was also great to see Nick Woviotis’ Dragon Team Sailing on the course; it has been wonderful to watch that program grow and help out. This year’s J/24 Worlds turned out to be a great regatta for our customers and for Quantum, giving us positive momentum for future J/24s. I had the pleasure of working with each team during the event, and I hope to see all of the competitors at the next J/24 major regatta!